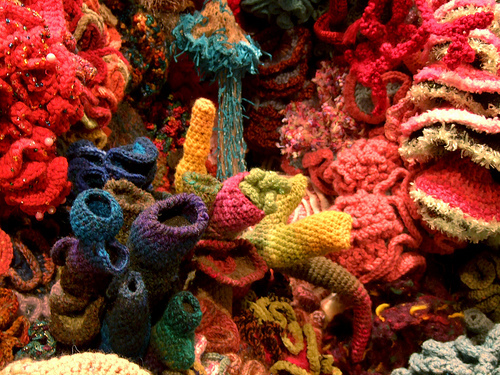 In keeping with the briny theme, do you know about the Crochet Coral Reef? My friend, Judy, showed up at my door in December armed with a number of crochet needles and a project. Not just any crochet project, mind you, but one involving the realization of hyperbolic space through needlework. Sign me up! She spent the weekend trying to teach me to crochet, which I admit is a slow-going process. She was inspired by Hyperbolic Crochet Coral Reef project started by twin sisters Margaret and Catherine Wertheim, who also founded the Institute For Figuring which, in their own words, “…is dedicated to the poetic and aesthetic dimensions of science, mathematics and the technical arts.” In 2005, in response to news that the Great Barrier Reef was under grave threat from global warming and environmental pollutants, the sisters decided to recreate the Reef in fiber to draw attention to its fate. As it turns out, crochet is the perfect technique to use in recreating an ocean reef. In 1997, Cornell Mathematician, Dr. Daina Taimina (who is also skilled in the feminine arts of handicraft) discovered that through crochet she was able to create an actual physical model of hyperbolic space, something that had eluded scientists for years. Of course, hyperbolic planes exist all over the place in nature, and all sorts variations can be seen under the sea in the form of coral and sea slugs. Her excellent book, Crocheting Adventures with Hyperbolic Planes, explores the history of hyperbolic geometry using the craft of crochet to illustrate her points. The Reef Project, which started in the Wertheim sisters’ Los Angeles living room, quickly took on a life of it’s own, spawning satellite reefs all over the world in places as far-flung as Melborne, Latvia, Croatia and New York. Various reefs have been exhibited in several cities, most recently at the Smithsonian in D.C. The project is ongoing and the IFF website contains information not only on how to get started with hyperbolic crochet, but how to join or start your own satellite reef. It is the perfect intersection of craft, community, science and activism. I am a totally novice at crochet (hell, I can barely knit), but this project inspires me. I really don’t need any more hats, but bring on the sea slugs! This entry was posted on May 24, 2011, 12:46 pm and is filed under inspiration. You can follow any responses to this entry through RSS 2.0. You can leave a response, or trackback from your own site. Hyperbolic crocheted reefs rock! Part of what’s so awesome about them is that every mistake you make just adds to the curly, swirliness of them making them perfect for beginners. They had a whole exhibit of them in DC at the Smithsonians. Would love to work on a little reef project if people want to get together.